In this talk I will draw on stories from my work with teenagers in educational and therapeutic settings to address the question: how and why do folk tales and myth take us to places other literature cannot reach in applied work? Through what mechanisms do they engender creativity, engagement and bravery in participants? I will argue that, to give participants access to the riches of this material, the storyteller’s practice must be dialogic, responsive, open-ended, and embedded in the unique context of the setting. I will go on to use some of my own stumbling blocks, as well as some of my small successes, to illustrate the implications this may have for the planning and delivery of applied storytelling projects. In working with young people in educational, social and therapeutic settings, why start with a story? Why would you introduce a fantastical narrative into the room – wouldn’t it be better to simply do drama or creative writing or some other artform with the young people, to get them to express their own ideas? Isn’t it, in some way, an imposition on them to ask them to engage with an Indian myth or a Scottish folktale, material that is exotic and perhaps irrelevant to them? Clearly, as a storyteller working with teenagers, I feel these stories do have a tremendous value. My experience in the ‘bottom sets’ of a secondary school, in an adolescent psychiatric unit, in youth clubs, in a youth theatre for teenagers with additional needs, has led me to conclude that myth and folktales have the potential to bring the young people to places they could not otherwise reach. Why should this be? I believe there are three main reasons and will put these to you. I was working with a special needs youth theatre, and told the Welsh myth of the youth of the solar deity Llew Llaw Gyffes over two sessions: the coercion of his mother to come out of her isolation, his supernatural birth, his mother’s disowning of him and refusal to name him or let him marry a woman, his adoption by his uncle, his need to overcome her curses through trickery and skill so that he can come of age, his magically created wife Blodeuedd the flower woman, her betrayal of him, his suffering in the wilderness, his eventual revenge on her and her lover. The young people listened with great attentiveness, then explored the story through drama, creating their own retellings in modern-day settings. Their versions showed the hidden regret of the powerful mother when she abandoned her son; the impossible situation of the flower woman who was given the ability to love passionately, but not the strength to be faithful (they in fact portrayed her as a robot); Llew being unable to watch when revenge was finally taken on his wife. They also showed things that the story left out: what became of Llew’s mysterious twin brother who turned into a fish? What was it like being Llew as a young boy with no name? To us who knew the young people well, it was evident that some of these themes were highly relevant to the group. Several of them had been taken from their families into foster care; some had been bullied at school for being ‘different’; many had anxieties about finding girlfriends or boyfriends, and about carving out an adult life for themselves. The power of their dramatic retellings owed no doubt in part to the conditions of their lives, as well as to their skill as actors. How does story bring us into new territory? The first way in which I believe the story facilitated this work was in engendering creativity. This is often discussed as if it were an ethereal property of our minds, something we are born with and which children have in large doses. However, I follow Lev Vygotsky (2004(1967)), who helped us to understand that it originates in our personal experience. Creativity, for him, is the ability to combine elements of experience in innovative ways. I have found that myths and folktales provide raw material that enriches the palette of experience from which young people can create their own drama, artwork, writing or stories. It is always difficult to choose the right one, but my main criterion is something like ‘openness’: I avoid moral fables whose meanings are already resolved, choosing instead the larger, more open canvases of myth and meatier folktales. I look for complex moral and emotional territory, characters encountering situations which are many-sided. These provide infinite ‘hooks’ for listeners – everyone will find something which intrigues, provokes or delights them – and this is what they may choose to develop in any subsequent creative work. Stories continue to intervene in our maturation process throughout our lives. However, adolescence is undoubtedly a crunch point when, as Vygotsky (1967) says, there is an intensification and a reorientation of the imagination towards trying to understand and adapt oneself to the adult world. So in listening to the story of Llew, the young people in the youth theatre were guided through very complex emotional territory. Aspects of this resonated with their own experience, but this was given a new shape by the story. It introduced, in magical form, new elements of experience, characters, situations, and perspectives from which to view them. Entering deeply into sympathy with Llew, the young people nonetheless then engaged with the dilemmas facing other characters, from the inside. The drama they were then able to create was on a level of creativity and maturity they could not, I feel, have produced without this stimulus material. It was a short-cut to higher ground. To put it another way, the group became cleverer, subtler, more creative, within the storyworld than they were outside it – and so are all of us. The second, and related, factor is that of engagement – the way in which a story can become stitched into a listener’s mind, in a way that information presented in other ways usually does not. And paradoxically, this relies on the very lack of detail, description and explanation in myths and folktales – their ‘sparseness’. Walter Benjamin (1936) accounts for the memorable nature of stories by pointing to their lack of ‘psychological shading’. I suggest this is one of the principal differences between literary stories and told stories. The storyteller does not usually say why Red Riding Hood chose the path of pins, or how she felt when she saw the wolf’s sharp teeth. We rather experience her choices and fill in the gaps for ourselves – a two-sided process which Tom Maguire (2015) calls ‘metonymic representation’. This, said Benjamin, enables each of us to integrate the story into our own experience. 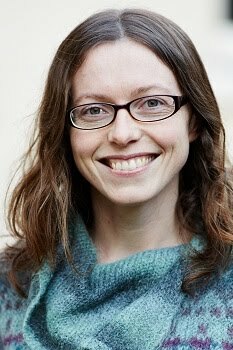 Storyteller Shonaleigh Cumbers expresses much the same thing when she says that stories are remembered and passed down (e.g. in books of folktales) in a sort of ‘dehydrated form’. The art of a storyteller is then to ‘rehydrate’ them – to convey them in enough detail to bring the listener into the storyworld, but not so much that you obstruct her own construction of it in her mind. If I asked the young people in the youth theatre to describe Llew’s mother, or her castle, each of them would give me an utterly different description. All I might need to do to trigger this process is to give an imperious gesture, or tell how she spun round on her heel away from her baby boy lying on the floor. This ‘filling in of gaps’ extends beyond the appearance of people and things, to their motivations and the chains of causality determining what happens in the story. Once more, this will intersect with the listeners’ own life concerns. The young people were provoked by Blodeuedd’s betrayal of Llew into trying to account for her actions, and to decide whether she deserved the punishment that came to her (she was turned into an owl). This led them into drama which variously seemed to suggest she was not a ‘real person’, or that Llew and his uncle should be blamed for creating such an object of desire without thinking about the consequences. Two girls, who in everyday life were particularly fixated on finding boyfriends and husbands, each portrayed Blodeuedd as a kind of victim of the madness of dependent love - an awareness which I hope will serve them well. All the dramas showed a real sense of tragedy, rather than judgment of Blodeuedd. The story provoked complex thought and deep exploration by leaving gaps, areas of cognitive dissonance. The third way the story brought us into otherwise inaccessible territory was by engendering bravery – the emotional courage to spend time with such troubling situations and emotions. This property of story as a metaphor is recognised by therapists who use storytelling (e.g. Crawford et al 2004, Gersie and King 1990, Sunderland 2000). Margot Sunderland (2000) finds that the valuable work of expressing difficult emotions and developing an understanding of complex situations will occur within the client’s exploration of the story – in fact she urges therapists not to ask young people to relate the therapeutic story explicitly to their own experience. The work with the youth theatre members with additional needs was in no sense therapy and I am not a therapist. However, undoubtedly territory was being explored, through the metaphor of Llew’s coming-of-age trials, which was difficult for some of the young people. One young man, quite marginal to the group because of his tendency to isolate himself, clearly recognised this when he approached me in the mid-session break and nearly shouted, ‘I don’t want to hear stories about boys with no name – no weapons – no girlfriend!’ And yet he did choose to get involved in the drama, perhaps expressing something about his own identity, by portraying Llew’s runaway brother who escaped out of the story and into the sea, and went onto have more adventures there. The huge, detailed and containing metaphor of Llew’s life allowed for not only the exploration of difficult themes (such as parental abandonment, bullying), but a safe space in which they could be shared without exposing individuals. This is akin to Winnicott’s (1971) idea of the ‘transitional space’ of play – but I suggest the magical or otherworldly nature of myth and folktale adds another layer of insulation. The request to transpose the story to the present-day was an invitation to the young people to extract those themes of greatest concern to them. The collective creation and watching of these scenes then turned individuals’ private difficulties into a more universal, communicable experience. Relating back to the story, individual young people could perhaps feel that others had come through similar things and endured, even developed, through them. Under what conditions can story work in this way? Thus far I have made the case for using story in terms of its content and style, but I find the form of the storytelling exchange in applied settings is equally important if this potential is to be achieved. Applied storytelling (perhaps any storytelling) has its own strictures, of dialogue, encounter, reciprocity, open-endedness, to which I feel I have been led by my practice, but which are borne out by influential theory. I also feel most of my teenage participants are aware of these rules on some level, and particularly of when they are violated. Riding roughshod over them has consequences – to illustrate which I will tell you another story. I hope it will contextualise the three questions I have added into the mix for discussion purposes. Every week for over a year I have cycled out to an adolescent psychiatric ward to lead a storytelling session. The group has always changed from week to week as one young person is discharged, another arrives. One day, after two sessions with nearly the same group of girls, I was sent an email by the teacher with feedback collected from the girls. Most said, although they enjoyed doing something creative together, they thought the sessions were ‘childish’ and sometimes ‘boring’. I reeled for a moment, then looked over their comments in more detail, and reflected – what did they mean? 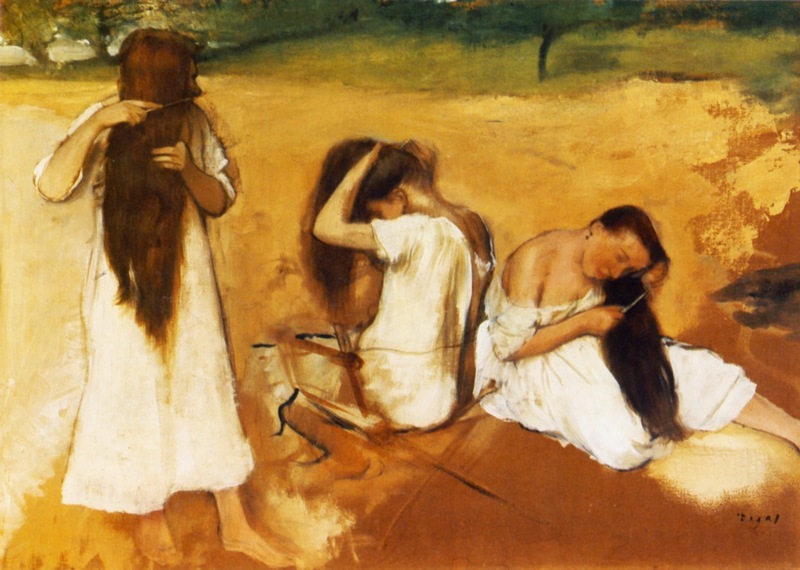 The first session with them had seemed amazingly productive – with my guidance, they had enthusiastically created their own folktale based on a Renoir painting, ‘Girls Combing Their Hair’. This was a very perceptive allegory of the ways our culture forces girls into harmful stereotypes. The following week I had come back armed with another book of paintings, by Chagall, and with the expectation that they would produce another wonderful, healing feminist parable in the same way. Instead I found averted gazes and stony silence. A few of them eventually produced a fantasy tale which was perhaps aimed at satisfying me – an allegory of a woman who recovered from her self-imposed isolation. Every guidance I had ever had about working in this setting had pointed in a single direction. The teacher and the occupational therapist both urged me to be flexible, be responsive, don’t try and over-structure things. Don’t expect particular outcomes. My supervisor, experienced in arts and mental health, suggested that the powerful thing would be the very act of asking people what they want to say, rather than seeing them as ‘sick’ people who might need to say certain things or hear certain messages. But these felt like negative pointers – pointing me away from things rather than towards a positive goal. I felt the need of a ‘concept’ and by habit searched for an instrumental one that might free me up from pure reliance on instinct – which I feared may be lacking. It had not occurred to me to just ask the young people what they wanted, or follow their interests on a week-by-week basis. And now, in their feedback, they had given me the same rule – it’s got to be playful, not too ‘holy’, ‘boring’, earnest, don’t have too therapeutic expectations. I realised that, rather than having a plan, I needed to hope for invitations, to accept all offers , to trust that they will bring up the things that they need to talk about. Most of all, to gratefully depend on those few individuals in the room who break the silences and continue to create opportunities for the whole group. Indeed there is a strong dynamic of gift and acceptance going in both directions here – I am very reliant on their contributions, and they need me to be robust, reliable and cheerful but responsive. Perhaps this is why any time I have bulldozed through with my own plan, there has been a breakdown, or a fizzling out. So maybe this is the difference between the storyteller and the therapist – the emphasis on the gift and its open-endedness, the trusting each other to go on a journey together rather than having any idea of destination? In all this I feel my favourite theorists looking wisely over my shoulder. Benjamin (1936) asserts that the storyteller conveys experiential, situated knowledge, not pre-packaged, disembodied information. Even when I am telling a group of young people a story from another culture, or one I have read in a book, my telling will be conditioned by my own life experience and I am appearing as myself, a fallible and vulnerable work in progress, in relationship with my listeners and not in full control. This must be, in Martin Buber’s (1957) sense, a real dialogue between ‘I’ and ‘Thou’. In this case, in trying to protect myself with a structure aimed at eliciting a particular sort of text from the young people on the ward, I was violating this principle, and they smelt it. I don’t mean, by this, that storytellers shouldn’t have outline workshop plans, but rather that these should be offered with the aim of facilitating dialogue and creating a space in which the unexpected can happen. Julian Stern (2013) suggests that real learning only occurs when both the teacher and the student are surprised. In the first session, I had arrived with a book of paintings and little more, yet came away overwhelmed by what they had seen in the painting, and how powerfully they had articulated this in a folktale. The second time, by the very act of trying to make the same thing happen, I made it impossible that it would. As well as mutual vulnerability in the workshop, there is a kind of contract between the teller and listener in the very act of telling the tale. Tom Maguire (2015) suggests that while this is present in any form of theatre, the direct address of the listeners by a storyteller demands ‘a distinctive form of reciprocity’ (p.118). In order to start telling a story, I need to earn the consent of my adolescent listeners, and also to respect their right to withdraw this gift at any time. While I am telling the story, I must respect the fact that much of their active engagement with it will occur within their minds, and not demand a certain response. It’s just – you know when you’re telling a story and some of us put our heads down like that – it’s only because some of us do it to, like, picture the images in our heads. This boy was a keen story-listener but often a cynical participant in any follow-up activities, and he was quite consciously trying to steer me to understand that he was engaging, but in his own private way I could not see. Yet if I do nonetheless want to facilitate creative work based on a story, I first and foremost need to create a space in which both the young people and their support workers or teaching assistants can initiate a sort of dance or story-conversation. This can become genuine dialogue, which might take us far from the track of the lesson or session, and off on surprising tangents. In a school setting, this requires an uncommonly brave class teacher, as it bears the risk that the curriculum goals or learning outcomes may not be met; however, it also carries the potential that the pupils’ understanding of the topic will be greatly broadened and deepened. Indeed, Julian Stern (2013) bewails the dominance of learning outcomes in education, as they can in fact undermine the potential for real learning. Likewise, in the psychiatric ward, my feeling is that, paradoxically, storytelling sessions are only likely to be beneficial if they are not understood as therapy and do not have specific therapeutic goals (Rowe 2007). The most memorable sessions in any setting have been those where a story from me has triggered stories from others present. On one occasion in the psychiatric ward, I told two very contrasting versions of Red Riding Hood from Jack Zipes’ (1994) collection (the Charles Perrault version we all know well, and a much more biological peasant version), and the young people spent the rest of the session revealing to each other the ‘real versions’ they already knew of other fairy tales, full of indignation at the way heroines had been turned into victims. Just as often, young people themselves have known how to proceed with a story when I have not: after telling the story of an old Bedouin woman, I realised my telling had not been able to bring the class of low-ability boys into her world, so different to their own. There was awkward silence until one very disruptive boy asked whether the class could act it out. He himself, very exuberantly, took on the role of the elderly matriarch, bossing about his classmates as he orchestrated the planting of an olive grove, transposing the story into a family setting the pupils could all recognise. They then wrote vivid poems about her memories of life in the desert. By its nature, surprise does not always occur. Young people may not trust each other, or the storyteller, or the setting, enough to contribute; key individuals may be absent or a new group member may be inhibiting the others; they may prefer to mull over the story slowly and privately; or the story may simply be the wrong one to grab them. So I am trying to learn not to fear silence so much. On this occasion in the psychiatric ward, my attempts to generate particular outcomes actually set us back in our creative relationship. It would have been better to simply tell a story or two, and then sit companionably chatting of this and that, or simply doing some handwork together, than to bulldoze on through their reluctance. I am drawn back again and again to the strange Armenian form of beginning a story: Three apples fell from heaven: one for the teller, one for the listener, and the third for the one who paid heed. Surely the listener is the one who pays heed? Or does this third person represent the shifting role to which both the teller and listener should aspire? Should they both be paying heed to what is actually being generated in the exchange of stories, and moving on from there? Calvino, Italo (1956) Italian Folktales. Penguin Classics. Crawford, R., Brown, B. and Crawford, P. (2004) Storytelling in Therapy. Cheltenham: Nelson Thomas. Maguire, Tom (2015) Storytelling on the Contemporary Stage. London: Palgrave Macmillan. Winnicott, D.W. (1971) Playing and Reality. London: Tavistock Publications. Zipes, Jack (1994) The Trials and Tribulations of Little Red Riding Hood: Versions of the Tale in Sociocultural Context. London: Taylor and Francis.